DEMO Africa has become one of the startup competitions/events that gathers a lot of interest from startups all across the continent. Over the past 5 editions, the team has consistently been looking for startups to pitch at the event. This year’s event will be held in south Africa, and the team was in Ghana to look for a startup, for a complimentary spot on the coveted list of pitching startups. The Monday evening event was quite an unpublished event as lots of people didn’t attend. 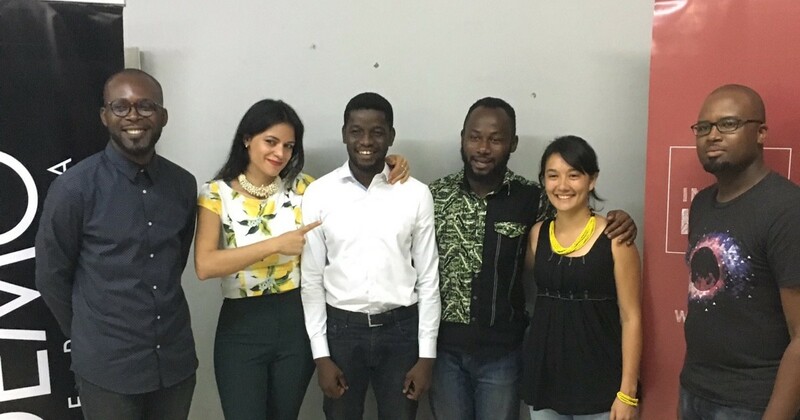 The event was held at Impact Hub Accra, as the coworking space has been one of the event’s partners. This year’s city-by-city tour, officially called Innovation Tour was also nicknamed #RoadToJoburg as the event will be hosted on 6th and 7th September 2017 in Johannesburg, South Africa. Among the officials at the event were Mbugua Njihia, Event Director, at DEMO Africa. and Victor Kelechi Ofoegbu, Community Manager at Impact Hub Accra, who both gave speeches at various points within the event. The startups were selected from a number of startups who pitched their businesses to Impact Hub via Twitter, on Saturday. These are the startups who qualified to pitch on Monday, at Impact Hub Accra. TroTro driver is a racing game developed by Innovative Ideas Ghana; it’s a Ghana-themed racing game where players ride in a Trotro, through the city, to meet location goals and collect points. SmartGas App — The team provides an app and device which help to provide a fast and convenient way to monitor your LPG gas and swap nearly empty cylinders with filled ones. Crowdfrica is a crowdfunding platform connecting underserved people, public schools and Clinics who can’t afford needed healthcare, education or materials to willing donors! Practical Education Network, also called PEN provides a teacher training program infused with MIT-style learning-by-doing to promote hands-on science regardless of resource constraints. They work with West African STEM teachers to design practical activities using local materials. Pasco is a service which allows students to access past test questions from their smartphones. All course content is delivered via the app. Maptech Logistics, a Kumasi-based team — who checked in via Skype — develops and deploys GIS-based business applications that augments productivity and efficiency for clients. ExpressMed Home Healthcare is a company which provides quality and accessible healthcare to patients in their homes or places most convenient to them other than the hospital. It is the company’s goal to make quality healthcare more accessible to patients and also to give people the opportunity to spend more time with the doctor and improve upon their health. #GrabACup is a locally owned and locally packaged breakfast pack which provides busy Ghanians with healthy and nutritious Ghanaian dishes. GRAB A CUP provides a combination of excellent food at value pricing, with fun packaging and atmosphere. Delano Truth is developing an innovative financing mechanism to help companies manage their corporate social responsibility through funding sustainable development programs that earn a return when evidence shows the programs achieve pre-agreed outcomes. Locagro, who also checked in via Skype is headed by Akwasi Tagoe, as Agricultural Services Manager for GreenCoastFoods (GCF) Ghana. Locagro wants to set up farms in the city to provide healthy produce to households and restaurants while supporting individuals to set up farms in their own homes, additionally providing a platform for farmers to present their farm and sell products to consumers directly. At the end of the event, Practical Education Network emerged winner, which gives them a spot on the list of startups to pitch in Johannesburg. They and 29 other teams will pitch for the coveted prize of DEMO Africa 2017 winner. The 30 companies will also receive mentorship and will attend a 2-day bootcamp in preparation for their launch and software and services worth more than US $150,000 each for the next three years. The DEMO Africa team has indeed built one of the most prominent events, which usually has lots of multinational companies as sponsors. Among many other goodies and opportunities, Practical Education Network stands the change of winning a curated trip to the Silicon Valley, US$120K worth of Microsoft Services Azure, and US$8K worth of AWS Tools and Services, when they win the major event in South Africa. I work on UX/UI, studied Computer Science, loved software enough to attend @MESTGhana and helped found @DevCongress. I play the piano. Also founded @BoughtSpot.